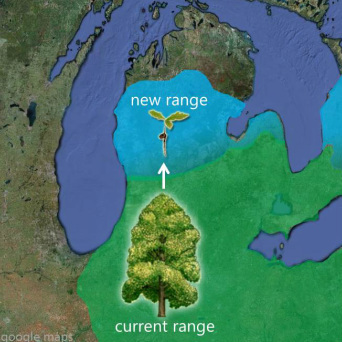 As climates warm, plant species distributions are expected to shift poleward. When plants colonize new areas, they will interact with new suites of organisms and the resulting biotic interactions may differ from those within the plants’ original range. Large net differences in biotic interactions with natural enemies could affect plant performance and therefore colonization success and range expansion dynamics. Despite the potential importance of herbivores and pathogens to plant performance, few studies have quantified how interactions between plants and their natural enemies vary across range edges. I explored the potential for foliar herbivores and pathogens to influence plant range expansion using a combination of meta-analysis and field experiments. First, I investigated the effects of invertebrate herbivores on plant populations using a meta-regression approach, and found that herbivory often played important roles in reducing plant population growth rates, corroborating the potential importance of invertebrate herbivores to range expansion dynamics. In my next two chapters, I planted ten plant species along a latitudinal gradient that contained the range edges of some of these species. I then monitored seedling foliar herbivory and disease, providing some of the first empirical evidence on how above-ground interactions with natural enemies vary across latitudinal range edges. Four out of five species experienced less foliar disease when planted beyond their ranges. The amount of enemy escape was coarsely predicted by distance dependent dynamics within species ranges. However, the species included in this study did not benefit substantially from enemy escape; common levels of foliar damage had only minor effects on seedling survival. This suggests that the biotic interactions considered in this study are unlikely to have a major effect on colonization success for these particular species. Even so, this study provides insight into what conditions are likely to result in enemy release beyond range edges and the scenarios in which this may lead to increased performance during range expansion.